Just Bread is back… for the second time this year and we all arrive at the e5 Roasthouse in high spirits. We welcome our smiling participants who are eager to get stuck in. The group is made up of men and women from Ethiopia, Eritrea, Pakistan, and Sudan. The morning starts off with bakers Jean and Kate introducing e5’s signature sourdough bread in the hospitable way we know how…with a loaf of Hackney Wild, butter, jam, and coffees! 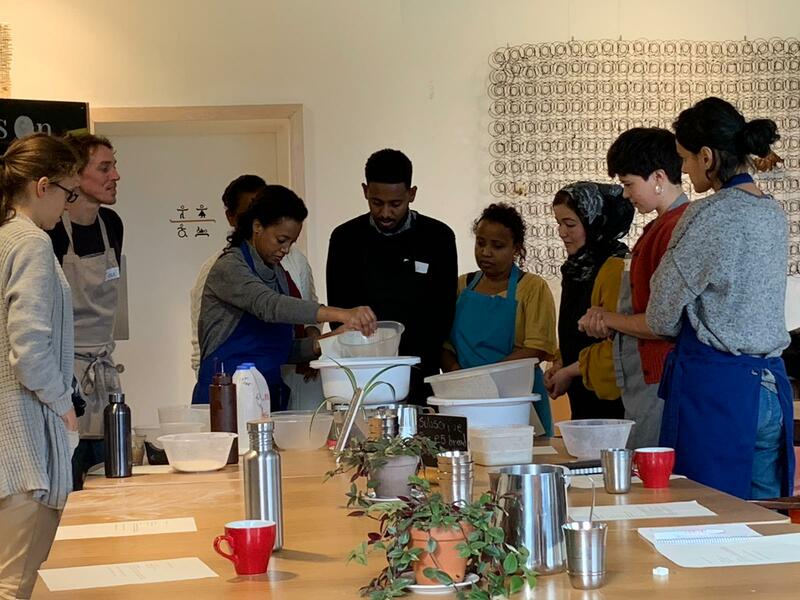 This is a short and sweet introduction, followed by a practice of how to make flatbread dough – the participants all help, starting with the leaven known as a bread starter, pouring in the exact measurements of flour, water, oil and sieving out the extra unintended sugar . The group are inquisitive and have lots of questions about the process and bread baked at the e5 Bakehouse. Sudanese Asida bread made from cornmeal or other grains such as sorghum and red millet. A staple food throughout Sub-Saharan Africa. Injera, the national bread of Ethiopia and Eritrea traditionally made out of teff flour, a sourdough-risen flatbread with a slightly spongy texture central to the dining process. Ethiopian spiced honey bread known as Dabo or it’s original name Yemarina Yewotet Dabo, a honey and milk bread filled with coriander, cinnamon, cloves, and ginger. Ambasha, an Eritrean and Ethiopian celebration bread that is slightly sweet, commonly shaped in a wheel pattern and prepared in a variety of ways with the distinct flavour of cardamom. Sudanese Kisra is a popular, thin fermented bread made from durra or wheat. Naan, meaning bread in old Persian and likely to have been invented between Pakistan and India is a tasty, light and fluffy flatbread made large enough to feed up to four people. It is cooked in a clay or metal oven known as a tandoor and can be flavoured with lots of spices and fillings. Roti is a round unleavened flatbread native to the Indian subcontinent and made from stoneground wholemeal flour also known as atta. It is a staple accompaniment to other food like curry. Currently, the price of bread in Sudan has doubled we were informed by one of our participants due to an increase in the price of flour, which has led to protests given the importance of bread in every Sudanese household. Bread is so entwined with the Sudanese way of life that it is usually called aish, which means life. All this talk leads on to conversations about other foods that are fundamental to the cultures of our countries. We get onto the topic of coffee and a bag of Ethiopian beans are passed around the table, everyone inhaling an aroma that paints a picture of bliss on their face. While describing the process of grinding the beans, you realise such an act is rather an art form and any deviation from it is considered outrageous. This moment is fleeting and before we know it lunch is served, a minestrone soup accompanied with beetroot and goat’s cheese sandwiches. Compliments to the chef Hannah. A perfect recipe for an autumnal sunny afternoon. The pleasure of sharing food around a table in the company of wonderful people from around the world is pretty special. It gets us talking about everyone’s interest in the project. It ranges from being interested in bread making to learning a new skill to work in the food industry and to set up a social enterprise inspired by a spiritual, meditative and healing ethos, conscious of the way food is grown and the fair treatment of employees.